Credit to Kucai Kuaci for the introduction. After hearing so much about this place through the tv and friends, (also because we are Char Kuey Teow and Nasi Lemak lovers) we decided to give this one a try. Mali's Corner at Danau Kota, Setapak. Located in one of the happening area of Kuala Lumpur, this shop never seems to stop welcoming their customers even till late in the morning. Mali's corner also benefit from its strategic locations of being just across the street of the mid-night bazaar in this area (Uptown Danau Kota). Char kuey teow special (extra prawns). RM7. Large RM5.50. Small RM4.50. 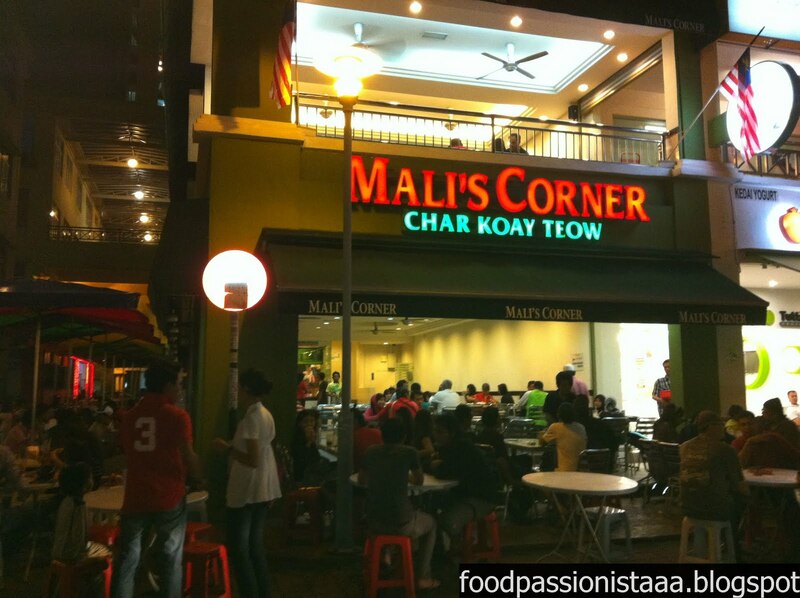 Having tasted the tasty and authentic Penang CKT from Ismal Char Kuey Teow , we set our expectation a little lower for Mali's Corner. However, the taste did not fail us at all! Infact it exceeds our expectations of finding the same quality as Ismal's CKT. This CKT is perhaps the best we have tried and to some extent it is better than Ismal's due to it slightly subtle taste of cockles. The gravy is very addictive, a balanced taste of sweet and spicy. A more focused view with flash. 8 prawns spotted in CKT special. Large only has 3 prawns. The only let down was they were not generous on the quantity of the kuey teow. You would expect more for the price you pay. Dishing it out: If you are going to make it worth your trouble, paying for the parking (if you park in its taipan-like compound) and the utterly inconvenient and confusing queuing system.. be sure to order a lot of their CKT. It is a must try and simply one of the tastiest in KL. Do not waste your time on the nasi lemak. As we were also upset to have to queue again to order the drinks, we ended 'outsourcing' our drinks from Ani Sup Utara (another shop nearby).